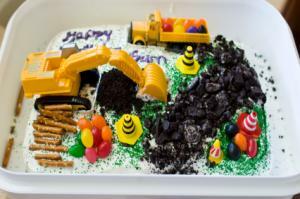 View a slideshow with more cake designs for birthdays! Coming up with something special for your child's birthday cake is hard when you're not an expert decorator. Luckily, there are plenty of easy ideas that go beyond sprinkles and balloons if you want to make your child's cake stand out without paying a bakery. The easiest way to decorate a cake is to not only look at photos, but follow instructions, too. Improvise using the tools and supplies you have on hand in order to make the best looking birthday cake with little fuss. The absolute easiest birthday cake to make is one that simply says happy birthday. All you need to do is bake and frost your favorite cake. To make the wording, you don't even need to have any special tools - you can actually just fill a plastic baggie with frosting and snip off a very small corner to make a hole for the thinned frosting to come out. Squiggly lines in bright colors of frosting around the edges of the cake are an easy way to add a little something extra to a plain message cake. Add candles just before singing to the birthday boy or girl and you're done. Place round chocolate covered candies on the top and sides of the cake. Use multiple colors or stick to just one or two if you want it to match a color scheme for the party. 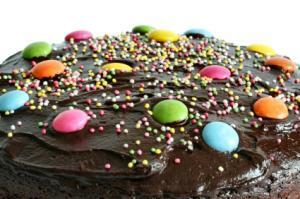 If you have a pastry bag with a round tip, use that to make brightly colored polka dots all over the cake. Otherwise, you can use a squirt bottle or even a plastic baggie with the tip cut off. Make sure you release pressure on the bag before lifting from the dot, otherwise you will get a little tip in the middle of the dot instead of a flat dot. Decorate the top, edges and borders with sprinkles, jimmies and candies you have at home. 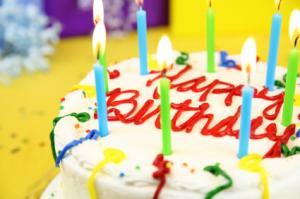 Finally, add a message and some candles before you serve the cake at the birthday party. 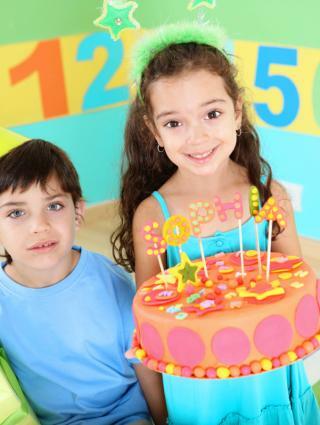 If your child is having a birthday party with a theme, you can still easily create a birthday cake to go along with that theme. While they may require a little extra planning and work beyond just printing a message or other on-hand decorations, they are still relatively easy for any novice decorator to complete. Bake a square or rectangular cake in your favorite flavor. Allow it to cool and frost with buttercream. Crush up chocolate sandwich cookies to create a pile of rocks. Sprinkle green jimmies on the cake to represent grass. Add the construction vehicles to the scene. Use chocolate covered candies, jelly beans or other round candy to represent rocks and boulders. Stack pretzel sticks to represent log piles. Use a small dab of buttercream to hold them together. Add a simple happy birthday message in an empty area of the cake using royal icing or thinned buttercream icing. 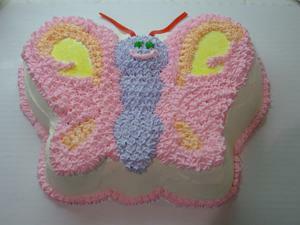 Lots of little girls would love a pretty butterfly cake. While a shaped cake may look intimidating, it's not as hard as it seems. There are two ways to make a shaped cake. One way is to purchase a cake pan in the particular shape you desire. For a butterfly, consider Wilton's Butterfly Pan or Nordic Ware's Platinum Butterfly Cake Pan. Follow the instructions included in the pan package, along with the baked-in design elements, to frost and decorate the butterfly. Bake your favorite three-layer cake, allow it to cool and fill. Place in the freezer for approximately 15 minutes, until it is firm. Trace a butterfly shape onto a piece of parchment or wax paper and cut out. Lay the shape on top of the cake, and secure with toothpicks. Use a sharp carving knife to cut out the shape of the butterfly. Brush any crumbs off the cake and clean up any flaws in your shape. Crumb coat the cake and then frost with your main butterfly color. Trace any additional elements into the smooth frosting, such as wing designs, body designs and face features, using a toothpick. Fill in the features using the frosting color of your choice and a star tip attached to a pastry bag. Not everyone enjoys working with buttercream. In fact, many people find it easier to pick up a pre-made package of fondant, and cut out shapes using cookie cutters. If this is you, simply add fondant to your grocery list when you shop for your cake baking supplies. Most major supermarkets carry packaged fondant in their cake supply section. When your cake is ready for decorating, simply roll out the fondant and use your themed cutters to cut out shapes. Affix them to your cake using a dab of frosting. Even if you don't know exactly what you're doing in the kitchen, you can still create a few great birthday cakes. Follow a photo and some simple instructions to create a wish-worthy cake!